Congratulations to Carleton U Ravens and Ottawa U GG's girls who won a silver and bronze medals at OAU's in Toronto. Both teams again featured numerous alumni Titans players as well as current Titans coaches. It was an eventful weekend of water polo on the men's side that saw UofT narrowly defeat OttawaU 10-7 in a hard fought battle. Carleton on the other side breezed their way through the group stage to meet UofT in the gold medal match. Carleton then played their best game to defeat UofT to win the gold in a nail bitter of a match 7-6. Earlier the Geegees defeated Western in the bronze medal match 9-6 to earn their first OUA meal in over 20 years. The Titans were extremely well represented in the tournament with 19 players and 3 coaches involved, including the MVP winner Dusan Boskovic, and MVG winner Ben Bouwer. Silver and bronze for Canada at UANA Youth Pan American Water Polo Championship! Three Titans alumni selected to play in 2013 FINA World Junior Championships in Hungary Aug 12-18. 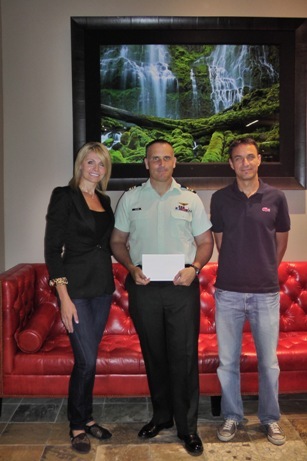 Congratulations to Dusan Boskovic, Alec Taschereau and David Lapins. For full roster and details, see here. Two Titans alumni selected to play in FINA World Championships in Barcelona. Congratulations toJohn Conway and Alec Taschereau. For full story, see here. 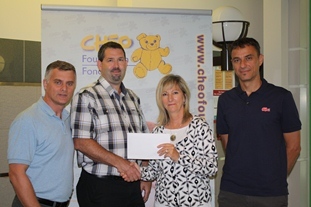 Titans Heroes Cup charity event has collected over $5,000 in donations to CHEO and RCR Education Fund! The winner in friendly water polo matches this year was Ottawa Police team. Congratulations and thank you to all who made this event a big success! Extended coverage of the event is updated daily on the tournament Website. Two Titans alumni selected to play in FINA World Championships in Barcelona. Congratulations to John Conway and Alec Taschereau. For full story, see here. 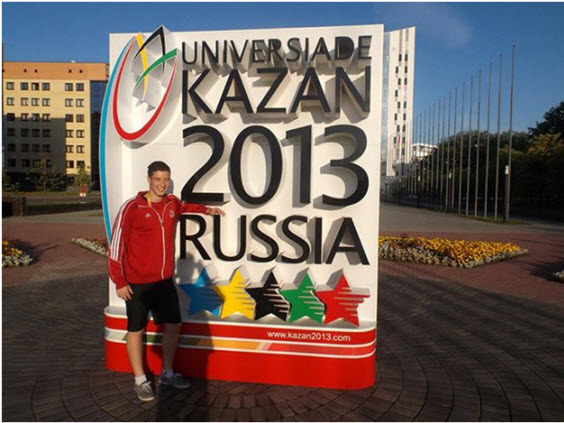 Dusan Boskovic from Titans representing Canada at2013 Summer Universiade in Kazan, Russia. He is joined with ex-Titans David Lapins and this year Gatineau/Titans Matija Dabic. Titans U16 Boys Win Bronze at National Championships - Congratulations to the our U16 Boys who finished 3rd in a field of 22 teams! A special mention goes to Eaun Scoffield who was was selected on the All Star Team! Games results and stats can be found here. 2013 Stay-in-Shape Program Details - This program is open to ALL athletes (participants will be grouped by skill level). The primary goal of this program is to fill the gap between the end of our regular season and the start of the Summer season by providing a fun venue that will allow our athletes to preserve their fitness level, albeit in a much less formal environment than our regular season practices. This year's program will consist of 16 sessions, all held at the Nepean Sportsplex. Please check thecalendar for the program schedule. Congratulations also go to two Titans alumni who have already been selected to represent Canada and are currently training for the National team in Calgary, namely Alec Taschereau and David Lapins! Eight Titans alumni, including one of our current coaches, Sarah McIIven, competed in the Senior Women Nationals over the weekend of March 30-31 and won the Silver medal. Congratulations to our Titans alumni - we are all very proud of you. Titans forever! On Wednesday March 27th at Nepean Sportsplex, the 5th NCWPL season came to the end with another win for Titans team. Strong defense was the key to victory which was easier than score suggested. Euan ,Victor and Yorek were instrumental in wining Gordon Van Tol Memorial Trophy. 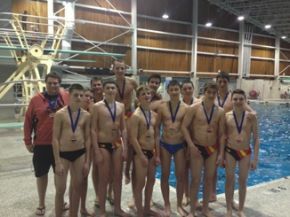 In bronze medal game Corbin and his crew were too strong for Senior team who failed to defend bronze from the last year. This year we have seen 6 teams competing with over 80 players participating in the league. All Stars: Duncan Kennedy (Titans 1). This year, the Women’s MLWP consisted of 6 teams from Ontario and Quebec. One of these teams was the Carleton team, formed of many current and former Ravens players. Six Titans alumni were on the team and of particular interest to our competitive girls, 3 of our female competitive coaches were on the roster, namely Rachel Baxter, Sarah McIlveen andVictoria Peters. They played twice against each of the other teams in a series of league weekends from January to mid-March. Last weekend, they met in Etobicoke for the final games. Rachel Baxter was the league top scorer with 33 goals to her name. Her stellar performance earned her the Season’s Most Valuable Player Award. 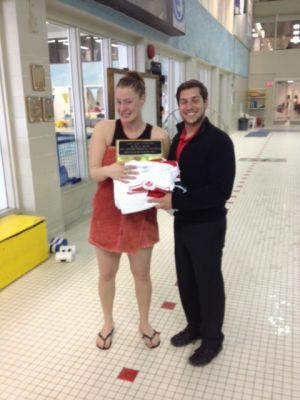 Way to go Rachel and well done to the Carleton Women! After losing a hard-fought semi-final game 8-7 against DDO, the Carleton Women regrouped and upset the Toronto Jets 8-7 to win the Bronze medal. A new addition to Ottawa Titans coaching team ! Titans introduce a specialty coach, an Olympian - Sasha Palamarevic. Sasha has been playing water-polo since the late 1990s. He started at the Club Aqua-Polo de Hull, and at the age of 19 he joined the Senior National Team (2006-2010). Since then, he competed in theWorld League, Volvo Cup, Commonwealth Championships, FISU Games, and Olympic Games - Beijing 2008. Sasha was introduced to Ottawa Titans by head coach Jerry Tesanovic. He will mostly scrimmage against the older players and share his water-polo expertise. His goal is to help develop strong and passionate water-polo players within Ottawa Titans family. We are very pleased to have Sasha assisting our coaching staff. More photos to view and purchase. Titans Cup 2013 - Congratulations to our U14 team on Bronze medal! Gatineau Turbo Cup 2013 - Congatulations to our U16 Boys team on Bronze medal! Team store is now active. If you wish to order Titans merchandise, follow the link http://www.getwetswimshop.com/.. Select 'Team Store Log-in' at the top right corner. User name is titans, password is getwet. Happy Team Shopping! Congratulations to Titans athletes who have been nominated for Quest for Gold funding for 2013. Dusan Boskovic and Victor Gomeluk to receive full cards and Filip Matic and Euan Scoffield for half cards. We invite you to follow their progress this summer as they train and compete with provincial and national programs. Every year, the Ottawa Sports Awards recognize sporting excellence in Ottawa by granting awards to local athletes, coaches and supporters who distinguished themselves. It is with tremendous pride that we reproduce below extracts from this year's awards announcements. For more information, please visit https://www.ottawasportsawards.ca/content/2012-ottawa-sports-awards-winners. Well done to all our current and alumni members. Go Titans! The Geoff Gowan is presented by the Coaching Association of Canada to recognize lifetime contribution to coaching development. How fitting it is, that Ottawa’s own David Hart just received this major national award. We are pleased to recognize David Hart for his national success, but also for his 35 years of work with water polo in Ottawa. From 2000 to 2008, David was Head Coach for the Ottawa Titans, which has grown to become one of the largest and best managed clubs in Canada. Even before that, he was co-captain of the Canadian water polo squad at the ‘76 and ‘82 Olympics, finishing ninth. David Hart is the only coach to have worked with all six Canadian National Team programs, and has won eight international medals as a coach. He is the only Canadian to have coached a foreign water polo national team, having been the head coach for Brazil’s Senior National Women’s Team. David’s major contributions to the sport include creating and implementing programs for the National Coaching Certification Program, and creating the “I Love Water Polo” program which is offered in aquatic centres and municipal programs across Canada. As the driving force behind the Canadian Water Polo League, he created the first-ever amateur league for an Olympic summer sport in Canada. He also is the author of the hugely successful Canadian Water Polo Dream Team concept. Filled with perseverance and competitiveness, this Ottawa Titans Water Polo Club player made his debut with the Canadian Men’s Senior Water Polo Team in 2012. Not only was he named to the National Team for games against Hungary and tournaments in Italy and Spain, Alec also played for Canada in the FINA World League preliminary competition. During the Canadian Men’s Senior Championships, he helped the Toronto Golden Jets win the bronze medal by scoring 14 goals in five games and being selected a Tournament All-Star. 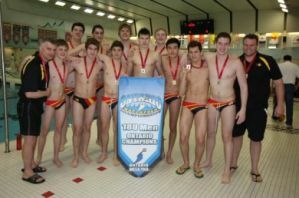 Yorek Hurrelmann, Victor Gomeluk, Duncan Kennedy, Euan Scoffield, Filip Matic, Filip Marjanovic, Danilo Vucetic, Lucas Fraser, Raphael Siegel, Laurent Brosseau, Harrison Graham, Jacob Paquette, Mihailo Krstic, and coaches Jerry Tesanovic, Scott Caswell and Owen Kennedy. Olga Bednarek, Meaghan Broddy, Annie Chinneck, Emma Cooke, Caitlin Dean, Hannah Hobbs, Brooke Jones, Annie Jones, Katie Kirkpatrick, Samantha Litwinczuk, Natalie Luciano, Evelyn Marshall, Sarah McIlveen, Veronika Neuwirth, Cellidh Parsons, Jelena Pavicevic, Veronica Rojas, Kaitlyn Sennema, Steve Baird (head coach), Rachel Baxter, Victoria Peters and David McClintock (assistant coaches).